You can run, but you can't hide from another upfront season, which kicked off Wednesday with Nickelodeon celebrating its return to No. 1 in the kids 2-11 demo. "We are back on top, and I can confidently say that we have plans in place to keep us there," Cyma Zarghami, president of Viacom Kids and Family Group, told buyers (and newly elected Viacom chairman Philippe Dauman) at Alice Tully Hall in New York's Lincoln Center. Nickelodeon now has a 60 percent viewing share in the kids ad-supported market. There are 40 million 2- to 11-year-olds in the U.S., "and we reached 30 million of them a month across our platforms," said Ron Geraci, evp of research at Viacom. "In preschool, we are killing it," he added, using a phrase that can really only be uttered during a kids network upfront presentation. Jeff Lucas, Viacom's head of marketing and partner solutions, announced that the network's partner marketing division, which was introduced as Nickelodeon Inside Out Solutions at last year's upfront presentation, has been renamed Nickelodeon Velocity. The division now offers marketers access to the Viacom Velocity Products Group. Nickelodeon Velocity "connects you to the fans that we share," said Pam Kaufman, Nickelodeon's CMO and president of consumer products, who pointed to partnerships with brands like Denny's, Sonic, Mattel, Walmart and Toyota. Kaufman also talked about Nickelodeon's growing retail footprint, with companies like Apple, Target and Uniqlo. Teenage Mutant Ninja Turtles is the No. 2 retail property among boys, second only to Star Wars. As a walk-up to this summer's Teenage Mutant Ninja Turtles theatrical sequel, Nickelodeon has partnered with New York Knicks forward Carmelo Anthony for TMNT x Melo, a Teenage Mutant Ninja Turtles-branded line of boys clothing and accessories that will debut in Macy's stories in May. "This is the biggest order that Macy's has ever [done] with Nickelodeon," said Anthony. Zarghami touted the network's "rich and full pipeline" of content, which "has never been this full or this varied." 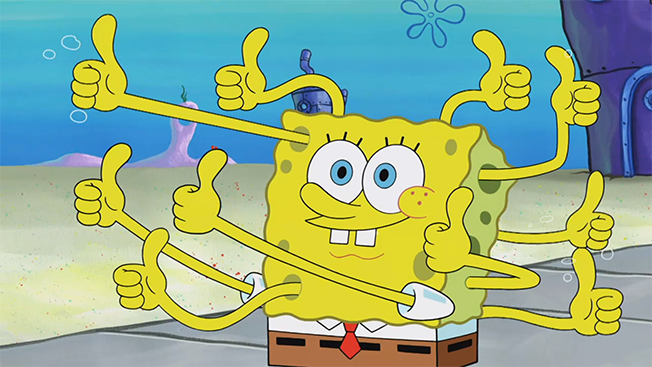 That's led by SpongeBob SquarePants, which has been renewed for two seasons (its 10th and 11th). Other shows that have been renewed include Harvey Beaks, Pig Goat Banana Cricket, Henry Danger, Game Shakers and The Thundermans. The channel has six preschool series in production, including two new shows. Rusty Rivets is inspired by the maker movement and follows the animated Rusty who repurposes objects into new contraptions. Sunny Day is about a hairstylist and focuses on community involvement and self-confidence. There are 11 new and returning animated series, with five new shows: The Loud House, which is based on creator Chris Savino's life growing up in a household with 10 sisters; Bunsen Is a Beast!, about the first beast (named Bunsen) to attend a human grade school; the series Mysticons centers around four girls who can become warriors and team up to fight an evil queen; Welcome to the Wayne, Nickelodeon's first digital short-form series green-lit for TV, is about a pair of 10-year-old boys and their adventures in a New York apartment building; and mockumentary series Pinky Malinky is about an optimistic hot dog who is living among humans. On the live-action front, Nickelodeon has 14 new and returning shows, including two new sports-themed shows: Crashletes, a series about sports clips that have gone viral, hosted by New England Patriots tight end Rob Gronkowski (think America's Funniest Sports Videos; this show's clips drew the biggest laughs from the upfront audience); and Jagger Eaton's Mega Life (working title), a docuseries about the 15-year-old skateboarder. Both shows will premiere later this year. On Tuesday, Nickelodeon green-lit a Legends of the Hidden Temple live-action movie, which was inspired by the '90s game show about kids trying to retrieve artifacts from a Mayan temple, along with a two-part animated Hey Arnold! TV movie, which will pick up where the long-running series left off when it ended in 2004. Previously announced upcoming live-action shows include School of Rock, based on the 2003 film with Jack Black; All In With Cam Newton, hosted by the Carolina Panthers quarterback who helps real kids realize their dreams ("This is a really good show with a lot of heart," said Newton, who was on hand); The Dudas (working title), about brothers who are one year apart but end up in the same class when the younger brother skips a grade; The Ludwigs, about five foster kids searching for their parents who have vanished under mysterious circumstances; and I Am Frankie, about a robot who is masquerading as a human. Flo Rida closed out Nickelodeon's upfront presentation by performing "My House" and the definitely not-suitable-for-Nickelodeon-audiences "Low" (sample lyric: "I'mma say that I prefer them no clothes/I'm into that, I love women exposed"). The other networks in Viacom Kids and Family Group, CMT and TV Land, will hold their upfront presentation Thursday afternoon.